If you’re looking for an Easter-themed dessert, this one is sure to be a crowd-pleaser. Not only will adults and kids alike enjoy eating this sweet Oreo treat, but the kids will surely have a lot of fun helping you make this, so be sure they’re in the kitchen once it’s time to decorate. 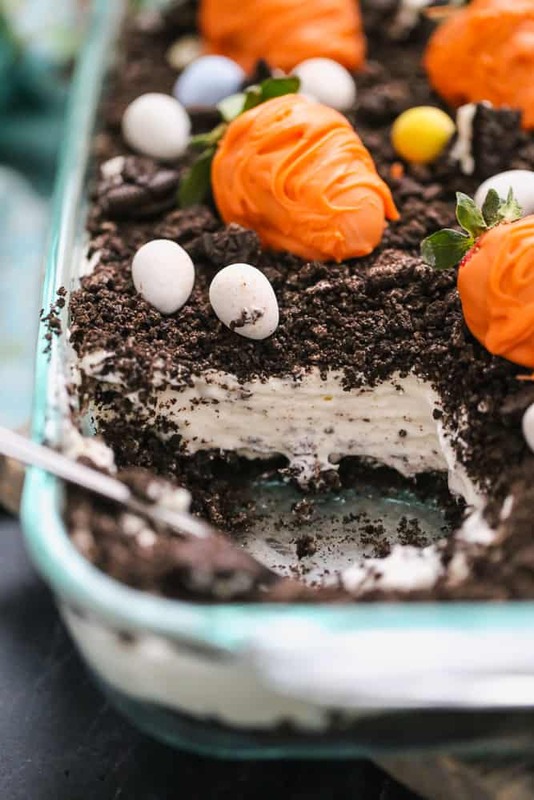 The recipe for Oreo Easter dirt cake comes from The Semisweet Sisters and is super easy to make. You’ll need plenty of Oreo cookies, cream cheese, butter, vanilla, chocolate pudding and cool whip to make the base for this dessert. Mix these ingredients together to create a creamy, super sweet and chocolatey pudding. Once combined, top the whole dish with crushed Oreos for the “dirt” effect. 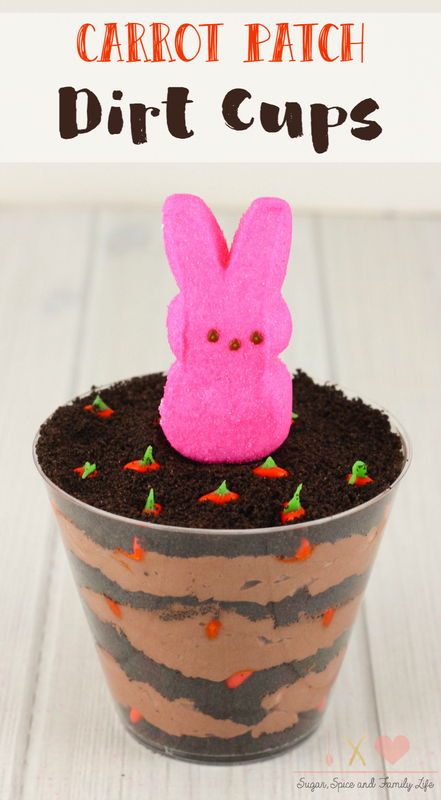 But instead of adding gummy worms, as you might see in a traditional dirt cake, you’ll add chocolate eggs and more seasonal toppings to give this a true Easter feel. The recipe suggests adding bunny-shaped Peeps and carrot tops to really give this dessert an Easter holiday makeover. You can make the carrot tops using store-bought frosting and orange food coloring. By cutting the corner of a Ziploc bag, you can pipe the frosting into little mounds to resemble a carrot top. Freeze them for about 10 minutes so they stay firm. Then top each one with edible grass, which can be found on Amazon, if not in your local store’s Easter candy section. 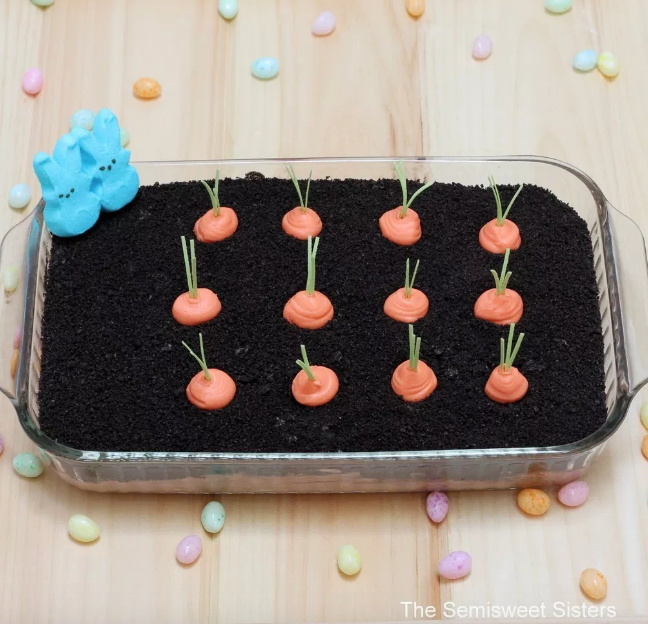 A recipe from The Baking Chocolates also recommends using orange candy melts and strawberries to make the carrots you’ll use to top your dirt cakes. That way, you’ll get an extra bit of fruity flavor when you bite into one of these chocolate-covered strawberries — uhh, carrot, rather. Meanwhile, a recipe from Sugar, Spice and Family Life took an even more chocolatey approach to creating the carrots. This version suggests using orange M&Ms instead. As you can see thanks to the clear cup used to house this dessert, the “carrots” were placed throughout the layers. You could also achieve this look using a clear casserole dish if you’re not serving these up individually. You can add a bit of green icing to the top layer to complete the carrot top look. It doesn’t really matter which method you use to create the carrot tops, because each option is delicious in its own right. So, go by what you’ve got in your kitchen already, or choose based on what your family will enjoy the most. Then, let the Easter dessert-eating begin!